I'm getting my sense of taste back. Grilled sardines laden with sea salt pepper and lemon. 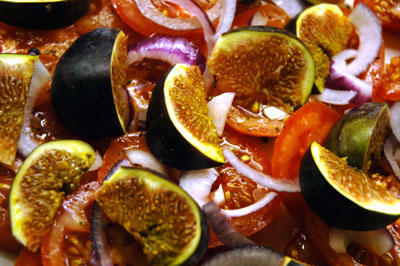 Salad of figs and tomatoes with red onion and argan oil. Tastes of summer and the sea. Perfect frankly. I don't have to say anymore. PS...Later that same night: Can I just say what a humbling experience writing a blog can be. I just popped over to read cookiecrumbs latest post at I'm Mad and I Eat and saw her entry for Blogday (I was trapped at work and didn't get a chance to post, I felt a bit silly doing it after the fact) where she chose this blog as one of her blogday recommendations. You have no idea how happy that makes me, cheers cookie! Are we allowed to do that with figs?!! Shoot, and I missed the farmers market this morning. funny, that broc, I saw that two weekends ago at the farmer's market in Sonoma, CA, USA. The farmer stated that it was the first brocoli known to mankind, in fact he said, it was known to cavemen. Er, I don't know if I'm buying that theory but it sure looks like it! cookie: yeah you can do that with figs, s'good! Nobody??!! nonsense! balderdash! a valued and respected comrade in arms ? I'd say so! Capital! jeanne: I love that. 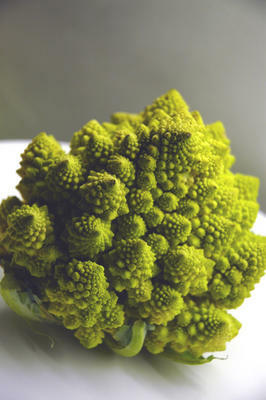 First broccoli known to man, do you think there are cave paintings depicting the wonderous whirly veg thats high in vitamin D? Have not seen that brocolli here yet. Love your saradines...and the fig salad. 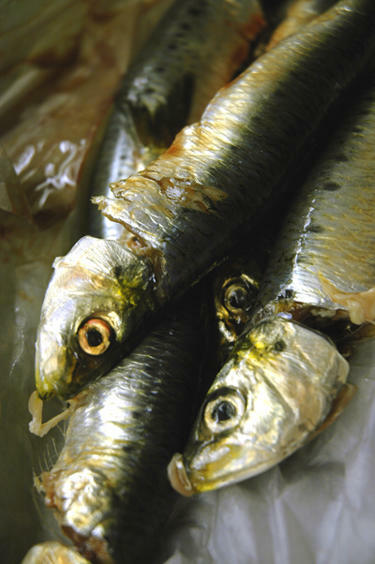 omg - i LOVE the sardines. and that one on the right looks like she's all akissy!